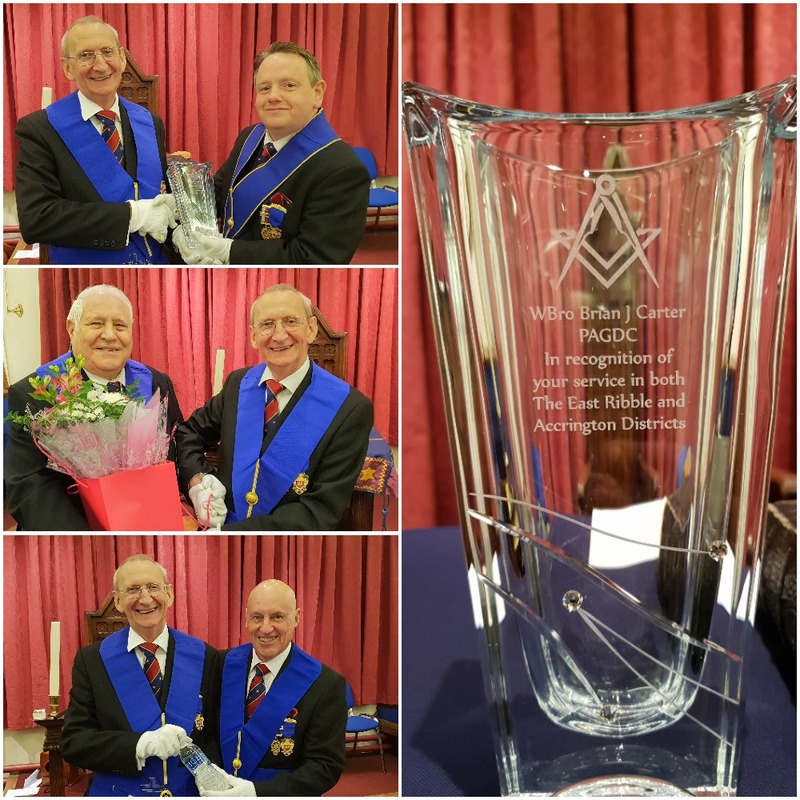 presentation of an engraved vase from the East Ribble District in recognition of his work since 2005 as The Deputy Chairman of the former Accrington District, his wonderful contribution as the Provincial Almoner and his work as the Northern Area APGP through to 2018. To the amazement of the Brethren present, Brian was speechless and completely taken aback to receive this presentation. That wasn’t all…. The normal gift at these celebrations is a decanter and something nice to fill it, however as Brian is a non-drinker a vase was deemed to be a more suitable token. It does still need something to fill it, and the Past District Chairman, WBro David Lightbown stepped forward and presented Brian with a small bottle of the finest spring water, (paid for out of his own pocket) which was gratefully and humorously received! Finally there needed something to go into the water, and the Past Deputy Grand Master VWBro Derek Thornhill presented Brian with a bouquet of flowers for his wife, Mrs Barbara Carter, to thank her for her unswerving support for Brian and Freemasonry. WBro Carter expressed his thanks to the District in a very touching and emotional manner, after which he received well deserved acclaim from the Brethren in recognition of what he already has, and no doubt will continue to do for Freemasonry.